"Quando siamo diventati abbastanza alti per riuscire a prendere il vasetto di miele, non ne abbiamo più voglia"
A fish is a water-dwelling vertebrate with gills that doesn't change form, as amphibians do, during its life. Most are cold-blooded, though some (such as some species of tuna and shark) are warm-blooded. There are over 29,000 species of fish, making them the most diverse group of vertebrates. Taxonomically, fish are a paraphyletic group whose exact relationships are much debated; a common division is into the jawless fish (class Agnatha, 75 species including lampreys and hagfish), the cartilaginous fish (class Chondrichthyes, 800 species including sharks and rays), with the remainder classed as bony fish (class Osteichthyes). Fish come in different sizes, from the 16 m (51 ft) whale shark to a 8 mm (just over ¼ of an inch) long stout infantfish. Many types of aquatic animals named "fish" are not true fish, and in the case of animals such as jellyfish and cuttlefish, are not even vertebrates. Other marine creatures that have in the past been considered fish, like dolphins, are actually mammals. Although most fish are exclusively aquatic and cold-blooded, there are exceptions to both cases. 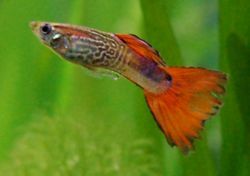 Fish from a number of different groups have evolved the capacity to live out of the water for extended periods of time. Of these amphibious fish some such as the mudskipper can live and move about on land for up to several days. Also, certain species of fish maintain elevated body temperatures to varying degrees. Endothermic teleosts (bony fishes) are all in the suborder Scombroidei and include the billfishes, tunas, and one species of "primitive" mackerel (Gasterochisma melampus). All sharks in the family Lamnidae – shortfin mako, long fin mako, white, porbeagle, and salmon shark – are known to have the capacity for endothermy, and evidence suggests the trait exists in family Alopiidae (thresher sharks). The degree of endothermy varies from the billfish, which warm only their eyes and brain, to bluefin tuna and porbeagle sharks who maintain body temperatures elevated in excess of 20 °C above ambient water temperatures. See also gigantothermy. Endothermy, though metabolically costly, is thought to provide advantages such as increased contractile force of muscles, higher rates of central nervous system processing, and higher rates of digestion. Fish are an important source of food in many cultures. Other water-dwelling animals such as mollusks, crustaceans, and shellfish are often called "fish" when used as food. For more details, see Fish food.